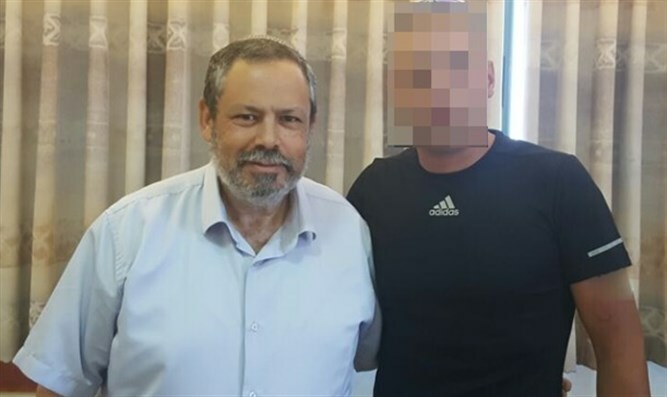 Head of Har Hevron Regional Council Yochai Damari describes his meeting with Arabs who helped Mark family seconds after terror attack. Last week we marked a month since the murder of our dear friend Rabbi Michael Mark. In the midst of the darkness of the terror attack, two Arab residents of the area helped rescue the other members of the Mark family who were in the car, while they waited for Israeli medical personnel to arrive (a period of roughly 10 minutes). These actions were of significant importance in avoiding further damage and preventing an even worse outcome. The first Arab man arrived at the scene of the attack seconds after the shooting and started prying the doors open with a jack in order to get the children out, and also to free the mother, Chavi, of the seat-belt that was constricting her breathing. Later on he brought the children into his car and made sure no one hurt them or kidnapped them; this while dozens of cars drove by with other Arabs threatening him and demanding that he stop helping the Jews. This man was subsequently fired from his job. I met with him and he asked me to try to prevent the revoking of his work permit. The second Arab man who helped was a doctor who arrived at the scene of the attack several minutes later while on his way to Jerusalem. He administered first aid to the wounded and then continued on his way when medical personnel arrived. I sent a letter to the Defense Minister this week to enlist his help in getting these two people work permits. I met with both of them. I understand the objective difficulties in expediting work permits and special treatment, but it is my opinion that in cases such as these it's our duty as the Jewish nation to show our gratitude to people who behave like human being should in these kind of situations. It is in times like these that we must strengthen the positive forces in the Arab community and broadcast the clear message that positive and normative behavior from their part will receive an appropriate positive and normative response from us. A determined fight against terror elements and all those who support terror, from those who give out candy after attacks to the inciters in the mosques, strengthening deterrence by expelling inciters and terror supporters from their homes. Giving monetary aid to any among the Arab population who want to relocate and pursue a future in Europe, the Far East, the US, or anywhere else. Civil government aid for infrastructure and the economy for Arabs who want to remain within our borders and accept the fact of our return home as a sovereign nation. Up until now every one of these solutions has been talked about separately, it's time to combine them.